This online resource was designed to provide you information for Musee d'Orsay in Paris, France. The station and hotel, built within two years, were inaugurated for the World Fair on July 14th, 1900. Laloux chose to mask the modern metallic structures with the façade of the hotel, which, built in the academic style using finely cut stone from the regions of Charente and Poitou, successfully blended in with its noble neighbours. Inside, all the modern techniques were used: ramps and lifts for luggage, elevators for passengers, sixteen underground railtracks, reception services on the ground floor, and electric traction. The open porch and lobby continued into the great hall which was 32 meters high, 40 meters wide and 138 meters long. From 1900 to 1939, the Gare d'Orsay was the head of the southwestern French railroad network. The hotel received numerous travelers in addition to welcoming associations and political parties for their banquets and meetings. However, after 1939, the station was to serve only the suburbs, as its platforms had become too short for the modern, longer trains that appeared with the progressive electrification of the railroads. The hotel closed its doors on January 1st, 1973, not without having played a historic role: the General de Gaulle held the press conference announcing his return to power in its ballroom. In 1975, the Direction des Musées de France already considered installing a new museum in the train station, in which all of the arts from the second half of the 19th century would be represented. The station, threatened with destruction and replacement by a large modern hotel complex, benefited instead from the revival of interest in nineteenth-century architecture and was listed on the Supplementary Inventory of Historical Monuments on March 8, 1973. 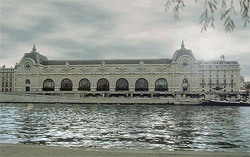 The official decision to build the Musée d'Orsay was taken during the interministerial council of October 20, 1977, on President Valéry Giscard d'Estaing's initiative. The building was classified a Historical Monument in 1978 and a civil commission was created to oversee the construction and organization of the museum. The President of the Republic, François Mitterrand, inaugurated the new museum on December 1st, 1986, and it opened to the public on December 9th. The museum has been organized on three levels: on the ground floor, galleries are distributed on either side of the central nave, which is overlooked by the terraces of the median level, these in turn opening up into additional exhibition galleries. The top floor is installed above the lobby, which covers the length of the Quai, and continues into the highest elevations of the former hotel, over the rue de la Légion d'Honneur. In the build-up to summer, the Musée d'Orsay invites you to discover two artists deeply rooted in the symbolist aesthetics and the Art Nouveau movement of the end of the 19th century with two new exhibitions: Gallé, the Frenchman, with a presentation centred on his ultimate masterpiece; and Polish Mehoffer, with about thirty paintings, projects for frescoes and stained glass. The works of these very different artists emanate an aura of mystery, a strangeness that description and explanation cannot fully dissipate. The Musée d'Orsay is a national museum which opened to the public in December 1986 in order to show, in all its diversity, the artistic creation of the western world from 1848 to 1914. The museum's nationally-owned collections originate from three main institutions: the Musée du Louvre, for works by artists born after 1820 or who emerged into the art world with the Second Republic (1848-1852); the Musée du Jeu de Paume, which had been dedicated since 1947 to Impressionism; and finally the Musée National d'Art Moderne, which, when it was installed in the Centre Georges Pompidou in 1976, had only conserved works by artists born after 1870.